Hillary Clinton is a famous Politician from USA, she is 71 years old and still alive, born October 26, 1947. Hillary Clinton (born at Edgewater Hospital in Chicago, Illinois) was a former Senator for the State of New York. She was first elected as a senator on the 7th november 2000. She is married to former President Bill Clinton, and was America's first lady in his presidency from 1993 to 2001. Hillary Rodham studied law at Yale University and after graduating she worked as a lawyer. In 1974 she moved to Arkansas and married the following year with William Jefferson Clinton. Hillary continued his practice at the law firm of Rose Law Firm and was considered one of the most influential lawyers in America. As America's first lady, she had considerably more influence than usual and contributed greatly to include a proposal for a public health insurance, Clinton Health Care Plan, which, however, was not adopted. She was strong in the media spotlight in connection with her husband's infidelity, the so-Lewinsky scandal in 1998. She was part of the U.S. delegation to Norway at the Winter Olympics in Lillehammer in 1994. Hillary Rodham Clinton is the first former first lady who has made â€‹â€‹choices and in 2000 was elected as senator for New York State, a position she was re-elected by a large margin in 2006. 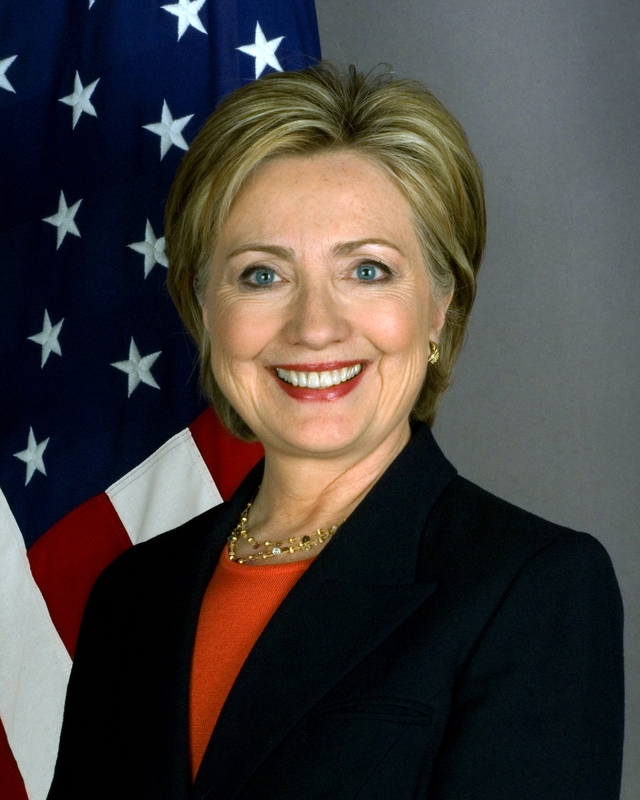 Hillary Rodham Clinton declared in 2007 as a candidate for nomination as Democratic presidential candidate in 2008. After a long nomination campaign, she had lost to Barack Obama, which she gave her support. 1. December 2008 she was appointed by Obama to his future Secretary of State. She was inaugurated on 21 January 2009. She is born under the zodiac scorpio, who is known for Transient, Self-Willed, Purposeful, Unyielding. Our collection contains 41 quotes who is written / told by Hillary, under the main topics: Funny, Women. "We would very much like to see Iran take a position as a responsible leader that doesn't intimidate or threaten or scare its neighbors and others. But the choice is really up to Iran and we're going to keep working to try to come out with the right decision"
"The challenges of change are always hard. It is important that we begin to unpack those challenges that confront this nation and realize that we each have a role that requires us to change and become more responsible for shaping our own future"
"Voting is the most precious right of every citizen, and we have a moral obligation to ensure the integrity of our voting process"
"We don't have enough support for maternal leave and the kinds of things that some of the European countries do. So we still make it hard on women to go into the work force and feel that they can be good at work but then doing the most important job, which is raising your children in a responsible and positive way"
"We must stop thinking of the individual and start thinking about what is best for society"
"Today we voted as Democrats and Republicans. Tomorrow we begin again as New Yorkers"
"There is a great deal of political pressure to only talk about abstinence, and to deny support for condoms and education on using them. This policy will lead to the unnecessary deaths of many people"
"In too many instances, the march to globalization has also meant the marginalization of women and girls. And that must change"
"In the Bible it says they asked Jesus how many times you should forgive, and he said 70 times 7. Well, I want you all to know that I'm keeping a chart"
"In the aftermath of September 11, and as the 9/11 Commission report so aptly demonstrates, it is clear that our intelligence system is not working the way that it should"
"In almost every profession - whether it's law or journalism, finance or medicine or academia or running a small business - people rely on confidential communications to do their jobs. We count on the space of trust that confidentiality provides. When someone breaches that trust, we are all worse off for it"
"If I want to knock a story off the front page, I just change my hairstyle"
"I'm not going to have some reporters pawing through our papers. We are the president"
"I will not comment on or confirm what are alleged to be stolen State Department cables. But I can say that the United States deeply regrets the disclosure of any information that was intended to be confidential, including private discussions between counterparts or our diplomats' personal assessments and observations"
"I think that we have to be constantly asking ourselves, 'How do we calculate the risk?' And sometimes we don't calculate it correctly; we either overstate it or understate it"
"I think I will serve as secretary of state as my last public position"
"I feel very lucky because of my parents and then my education, the opportunities that I've had, so I would like to continue working to improve lives for others"
"I believe in a zone of privacy"
"I also believe that we have an extraordinary opportunity for the United States and European Union to lead the world in developing and implementing new and more efficient technologies - smart electrical grids and electrical vehicles"
"For centuries, New York has served as the gateway for millions of people from all over the world in search of the American dream. It only makes sense that it would now serve as a gateway for the world's greatest athletes"
"Every president, if you watch what they look like when they come into office, you can see their hair turn white because it's such a hard job"
"Every nation has to either be with us, or against us. Those who harbor terrorists, or who finance them, are going to pay a price"
"Countries that will not tax their elite who expect us to come in and help them serve their people are just not going to get the kind of help from us that historically they may have"
"Both the American people and nations that censor the internet should understand that our government is committed to helping promote internet freedom"
"As I speak to you today, government censors somewhere are working furiously to erase my words from the records of history. But history itself has already condemned these tactics"
"All of us have to recognize that we owe our children more than we have been giving them"
"You show people what you're willing to fight for when you fight your friends"
"You cannot have maternal health without reproductive health. And reproductive health includes contraception and family planning and access to legal, safe abortion"
"What we have to do... is to find a way to celebrate our diversity and debate our differences without fracturing our communities"
"We'll hold out our hand; they have to unclench their fist"
"The challenge is to practice politics as the art of making what appears to be impossible, possible"
"The candidates we have in this campaign are... the most accomplished, in terms of public service, that we've had since 1960. One of them will be successful"
"The American taxpayer should not be treated more shabbily than debtors from other nations and we should be encouraging other nations to help rebuild Iraq's economy"
"The American people are tired of liars and people who pretend to be something they're not"
"Probably my worst quality is that I get very passionate about what I think is right"
"One day after laying a wreath at the tomb of Martin Luther King Jr., President Bush appoints a federal judge who has built his career around dismantling Dr. King's legacy"
"Often times when you face such an overwhelming challenge as global climate change, it can be somewhat daunting - it's kind of like trying to lose weight, which I know something about"
"No matter what you think about the Iraq war, there is one thing we can all agree on for the next days - we have to salute the courage and bravery of those who are risking their lives to vote and those brave Iraqi and American soldiers fighting to protect their right to vote"
"Many of you are well enough off that the tax cuts may have helped you. We're saying that for America to get back on track, we're probably going to cut that short and not give it to you. We're going to take things away from you on behalf of the common good"
"Let's not leave an educational vacuum to be filled by religious extremists who go to families who have no other option and offer meals, housing and some form of education. If we are going to combat extremism then we must educate those very same children"